I’ve always been scared of making pavlova. The crisp but delicate shell and frothy interior threatening to any non-baker. The fancy Russian ballerina name doesn’t help any either. What is it trying to be exactly? Any kind of baking that is more science than art is taboo to me but I was determined to give it a whirl. I put it on my bucket list at the start of summer and I’m glad that I got to conquer it. I was never been a huge fan of pavlova. It is a national treasure here in New Zealand and the dessert kiwis think of fondly in summer. A pavlova melts in the mouth like a cloud and doesn’t require any chewing, just a quick inspection in the mouth to get the flavour and and down it goes. Made mostly from egg whites and sugar, it lacks…substance. After reading many recipes, I settled on Nessie’s recipe from Baking Equals Love. Nessie is a fellow kiwi and an accomplished baker, only recently blogged about her first pavlova. I took in all her tips and you can find her recipe on her blog here. 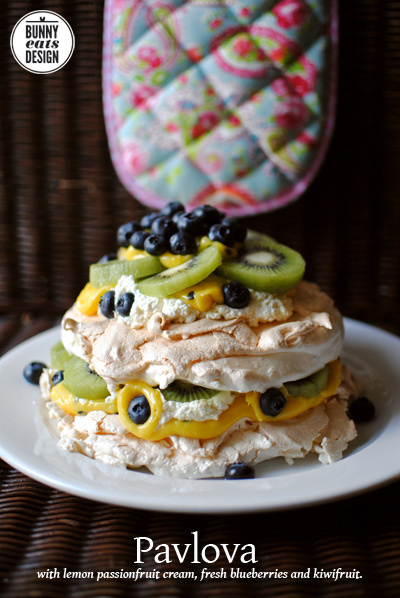 Instead of making 1 pavlova, you make 2 to make a stack. Stacks are great because you can glue them together with cream and tart filling. I strayed from her recipe only when it came to the fruit and filling. It was very well received by The Koala and our friends. Patisserie filling is a great pantry secret. It keeps for ages and handy to whip out when you want to impress. Barkers Patisserie Dessert Filling comes in a bag that you can pipe from directly. No mess! Best of all, it is gluten-free so perfect to add to a gluten-free pavlova that you might take to a summer BBQ where there might be gluten-free guests. If the pavlova are slightly different sizes (this happens from time to time), start with the larger one for the base. Place this on a round serving plate. Generously spread a thick layer of cream, snip a corner off the Patisserie bag and squeeze lemon passionfruit filling on top as you wish. If you are artistically inclined, feel free to squeeze cute designs. Think of this layer as the practice run. 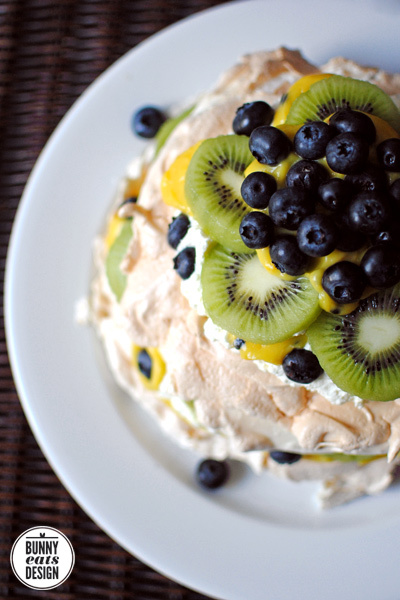 Layer blueberries and kiwifruit on top, followed by the smaller pavlova. Repeat with cream, lemon passionfruit filling and more fruit, layering and making a circular flower or mandala design as you go. This post is a Sweet NZ entry. Sweet NZ is another monthly event started right here in Auckland by Alessandra Zecchini and celebrates sweet treats by New Zealand bloggers. 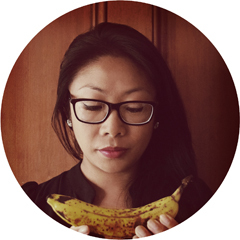 This month’s host is Michelle from Greedy Bread. That looks like how I picture Heaven. It looks so delicious. It could Asian tastebuds! Lots of tropical fruit flavours seem to work well though. I couldn’t find strawberries either but my compromise worked well. That is my very favorite cake. But till yesterday I had no idea it is actually from NZ. Your photos are simply great btw! Congratulations Genie, you have certainly made a beautiful Pavlova! And the fruit combos are very NZ! It’s one dessert I haven’t made either, but it’s a favourite of mine (not too sweet, nor filling). Thanks Eva. It really is a test on how well one can follow a recipe, but I bet you would breeze through it. Believe it or not, I really have to force myself to read a recipe line by line. I generally skim through and go from memory! I admit, I had the most fun decorating. It must be the artist in me. At the end I was finally able to get my hands in and NOT follow the recipe. This looks delicious! I’ve never made pavlova either – may have to give it a go this summer, I love them but it’s not so easy to just pick up a pavlova in the store here! OH MY GOSH! This looks amazing. Looks absolutely delicious :), I love your idea of making a bucket list of things to do.. Thanks MeroMusings, if you have a foodie bucket list or tried a new foodie thing recently, please join Our Growing Edge. Would love to have you. Sure I’d love to, what is the criteria and what do i have to do to be a member.. Your first pav looks stunning. You can definitely cross that off the bucket list with a flourish! This pavlova is simply stunning. Almost too pretty to eat! It was almost too pretty. Luckily some friends happened to pop buy and helped us eat it. It might have been too much for 2 people and pav doesn’t keep well.